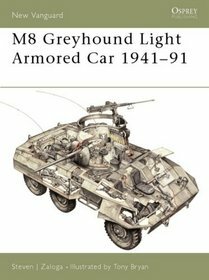 The latest title in Osprey’s New Vanguard series, this is the first book to cover only the M-8 Greyhound armored car (earlier books by Squadron and Allied-Axis have dealt with the M-8, but no one has devoted an entire book to it before). Unusually for a New Vanguard title, the book is based on primary research, a term that means the author uses direct source materials like government documents and manufacturer’s plans rather than secondary sources like other books. Much of the material was new to me, especially information about ammo storage and radio equipment, which is backed up by photographs. Most Vanguard titles are lacking in interior detail photos but this book includes some nice ones I’ve never seen before. All have intelligent, useful captions. Of particular interest to modelers are the color plates, including one of C-32, subject of the Italeri kit, showing it with a black camouflage pattern over the OD paint. There is also a photo and description of the vehicle with comments on the external stowage and early, improvised .50 cal ring mount.. Unfortunately no photo or drawing in plan view is included, although a reference in the bibliography specifically references that issue. 10 different vehicles are illustrated in the color plates, includinga Free French M-20, 2 post war Columbian M-8s, one with a Maxon quad 50 turret and one with a TOW launcher on the standard turret and a .50 replacing the 37 mm gun. The engine was also changed on these examples. The expected keyed cutaway occupies the center spread. The author discusses the lack of an armored floor and the mine vulnerability that resulted in first extemporized fixes, then a field kit and finally a factory fit. Regrettably it isn’t clear if this was external or internal and there are no photographs. Most modifications are documented with photos and the author catalogs the production line modification by production batch; i.e. : September ’44. This helps the historian place the approximate time of a photo and lets the modeler know how to equip his M-8 for a particular time period. The information demonstrates that the Tamiya and Italeri kits are from different production batches, the Tamiya being later with a production ring mount, and that both these kits have inaccuracies in there interior (the Tamiya is more accurate, if you were wondering). I always thought the floor in the Italeri kit was just plain wrong, but after reading about the armor kits…does anyone have a photo? Reasonably priced at a list of $14.95, the book is highly recommended both as a historical narrative and a modeler’sresource.